Sessions UK offer an over printing service in our Bureau department. If you have variable data to print including barcodes, we can overprint your own labels or provide the labels as well with the wordings of your choice. 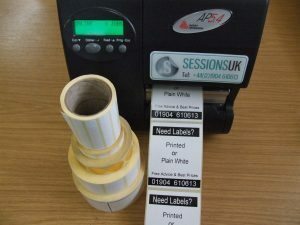 Whether it’s a blank stock label or your own generic pre-printed label, we can hold stock for you and overprint your variable data on demand as and when required.